So even the outgoing Maine National Committeeman wants an honest delegation. The ones trying to unseat the legitimate delegates seem to be just two. In the eight years since my son’s neurological regression, I have unfortunately had to learn first hand how broken our current system is, how much corruption in our country is harming those who are the least able to avoid and recover from it, and most grievously, how the party that I have been loyal to my entire life, has not only failed to address that corruption, but has helped to maintain it. I have personally briefed our state health commissioner and the head of Mainecare on the way that the federal government has defrauded our state and some disabled families of tens of millions (hundreds of millions?) of dollars, and have had to sit back and watch no action be taken, while families, school systems and state services buckle under the financial strain that is the federal governments (shirked) responsibility. It is a very difficult thing for a mother to suddenly find out that those that she has trusted and supported for a life time, are deaf to calls from her to bring an end to harm that is being caused to her own child, and children like him, because it is not politically expedient. Because of my experience and my loss of trust in what the Republican Party had become, I disengaged from politics (and the party) for many years, but returned recently because I saw that, because the Obama administration had been so egregious in their power grab and so brazen in their corruption, and because the consequences to our economy and society had been so grave, that people were beginning to wake up to how broken the American system had become, and that earnest men were again willing to fight for this country. They wanted to bring it back to the values it was founded on, to implement a true system of checks and balances, to bring real accountability for misdeeds and to bring actual freedom back to individuals… well it gave me hope that we might be able to resurrect some of what we have lost in the last twenty years. It’s too much to repost, but she goes on to review some of the dirty shenanigans that were pulled during the Republican Party state convention, and pointing out the craziness of how the older party structure members acted. Like the paid Mitt Romney staffer who had put on a Ron Paul sticker and was passing out fraudulent lists that claimed to be of Ron Paul supporters, to confuse the delegates. The blackout on news and information that embarrasses the powers that be, is breaking down. Everybody across the nation, the whole people, knows how party operatives acted in Maine. Using the usual Subservient Media Cartel is not working. No matter how much you broadcast baloney from the would-be party dictator in Nevada, and give him the free slant, we all know how they did all the tricks they could to stop a fair convention process and cheat the Republican grassroots surge. The Subservient Media Cartel is not working anymore. We all know now that the Obama administration and his State Department supported al Qaeda in Libya, and sent missiles and bombs into Libya on behalf of genocide brigades that wiped out the town of Towarga of 10,000 blacks, like they’ve been doing all over Libya. NATO bombed Libya and put American special forces on the ground, they said, to stop the massacre of Libyans. So what did they do about the reports of mass murder genocide? Forced the new rulers to tell the press they would tell their militias to restrain themselves. The “cat is out of the bag”, and when a cat escapes from the bag he goes wild. And you notice it. People look. Now they know about that massacre in Aleppo, in Syria, and the reports are circulating even in some of the Western press, that features interviews with residents of Aleppo that said it was NOT Assad’s troops but the “rebels” — the al Qaeda and the Muslim Brotherhood fighters that killed all those civilians and blamed it on the West. What, did they have sophisticated disinformation agents helping them? The United States is looking bad in Syria. The American people are so angry at all the corruption in their country and the way the Federal Reserve has robbed us with fake currency –yeah that’s right, many of us know your game their too– that they are not going to happily send their sons off to war again in Syria. And guess what? Any Gulf of Tonkin, or announcement about weapons of mass destruction, or attacks on US targets over there, you think Americans are going to rush so eagerly to fight a contrived war? Sure, the “powers that be” still have lots of power but not infinite. Too many are on to them. And they will look like they have won against freedom-loving Christians and non-Christians when they set up their new worldwide ruler eventually. But there will be some nations that will not play along, and in the end, this global regime will crumble. Those who can, prepare. If you cannot do anything else, learn fast..
Romney Greeted by Ron Paul Supporters – 03:35 p.m. CET (8:35 a.m. EST) – Mitt and Ann Romney were greeted upon arriving for a meeting with Polish Prime Minister Donald Tusk by hundreds of people lining the narrow streets here, some of whom held signs for another U.S. presidential candidate, Ron Paul. 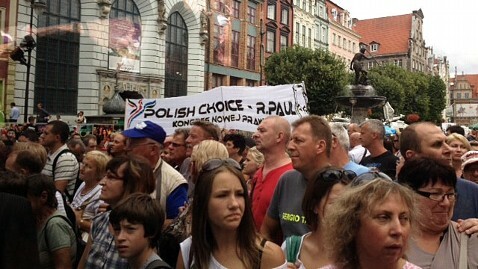 The large sign read “Polish Choice – R. Paul” with a photograph of Paul. The Romneys admired the crowd before heading into the meeting, Ann comparing it to a rally stateside. “Wow, look at that,” said Mitt. “This is great.” “This is like a local rally in the U.S.,” said Ann. the logic being that those men and women had been screened and trained and knew when and how to use their weapons in emergencies. Excluding our brave military personnel, police officers are probably the only individuals who rush toward the sound of gunfire. There were two military-trained men in the theater that day that took the bullets and died protecting their girlfriends, because it was illegal for civilians to carry concealed in Aurora, and to carry at all inside a Cinemark theater. Those two men –probably better trained to handle the situation that the Chicago cop that wrote the propaganda piece above linked for the New York Times– those two men saved ONE life each by giving their OWN lives, but if the individual right to bear arms had been respected there, they COULD HAVE SAVED MANY MORE. So, like the medieval priests who could not trust “ordinary untrained” citizens with that dangerous book, The Bible, her is a “non-ordinary trained” retired cop who thinks the layperson is incapable of handling emergencies. He almost brags about Illionois, where he says is the only state in the union that bans concealed carry. He should brag so much; that’s also where you have some of the highest-crime cities in the nation. One plus one is two. I was in Chicago briefly once, and I have worked with people who lived there. One of them lived in a high-crime area, of the most dangerous. Great big guy came busting into the property once, and simply began ransacking the place, breaking furniture, throwing around everything. In the kitchen he started stuffing his face. My friend, a fellow missionary, had sent out the other resident to call the cops, while he stayed with the intruder. Finally the intruder focused on him and began choking him. He was about to punch him into oblivion (did I mention his size? ), when my friend sent up a silent, faith-filled prayer, to stop this guy. As soon as he had prayed, the guy’s head jerked back as if itself had been punched, and he fell unconscious to the ground. A few minutes later the cops showed up. And a cop is worried about good, decent people having guns?? Are you kidding me? A motel manager I stayed at in Phoenix, Arizona, said a cop really liked him carrying a gun in holster in plain view. Meaning a gun is good for self-defense. My friend in Chicago, if he had not had an angel there to punch the intruder’s lights out, could have been killed in the time it took the cops to get there. #1. Once in South Africa a gang from the tribe most associated with the African National Congress burst into a MIXED-RACE church and started shooting and they were stopped by a member in the congregation who had his sidearm and shot back. #2. In the “confusion and terror” of a hit by PLO gunmen at a mall in Israel once, shooting at everybody, a granny took out her handgun from her purse and shot back. #3. My wife used her concealed weapon to stop her son’s kidnapper cold right in the act, facing him down with it. In Aurora, Colorado, it is illegal for anyone to carry a concealed weapon. In Cinemark theaters, it is policy to ban firearms. How did THAT work out in Aurora? If the citizens in Aurora have a bit of common sense, going forward it will work out like it did with the Luby’s Restaurant and Suzzane Hupp. A ban in Texas on concealed carry resulted in 23 deaths – almost twice that of the Aurora incident– because she could not bring her handgun in her purse to the place, and she could not shoot back. She saw her father die in front of her eyes, and then her mother. She pushed concealed carry into law. But if the Israeli granny stopped some bad guys (ONE person with ONE weapon), if my wife stopped the kidnapper in the midst of a crowd (Don’t you DARE tell HER she should have let the guy take him or just called the cops), and if one church member stopped a major massacre almost before it started, then the experience of ONE Chicago cop who has HIS protection on him at all times, well he can stuff it. The guy at the laundromat that he thought shouldn’t have the right, news flash: There are a lot of COPS like that. So what? And one more thing. Beware of becoming like the Arab of the story who ended up out in the cold, exiled from his warm tent in steps by a whining camel that convinced him he was just doing a good thing. England bans guns now. Gun crimes are going up. They had to issue arms to the bobbies. So much for gun ban logic. And then there’s history. When decent citizens are disarmed, tyrants only have to worry about the bad guys, because since when did lawbreakers worry about laws? So we know that a lot of people got killed and hurt in Aurora. They are telling us the shooter got his stuff legally. The cops were there in seconds, and it still was not quick enough. There was a whole crowd there. There were two military guys that died protecting their girlfriends that day. But training and all Aurora bans concealed carry and Cinemark bans all guns outright. Those two men –and probably a lot more people in that audience– could have saved a lot more lives than just their girlfriends that day, if only they had been packing. An Indiana-based medical equipment manufacturer says it’s scrapping plans to open five new plants in the coming years because of a looming tax tied to President Obama’s health care overhaul law. Cook Medical claims the tax on medical devices, set to take effect next year, will cost the company roughly $20 million a year, cutting into money that would otherwise go toward expanding into new facilities over the next five years. “This is the equivalent of about a plant a year that we’re not going to be able to build,” a company spokesman told FoxNews.com. He said the original plan was to build factories in “hard-pressed” Midwestern communities, each employing up to 300 people. But those factories cost roughly the same amount as the projected cost of the new tax. “In reality, we’re not looking at the U.S. to build factories anymore as long as this tax is in place. We can’t, to be competitive,” he said. They asked questions about how this guy got those guns in Aurora, Colorado. How does an unemployed graduate student afford to buy them? One theater witness said somebody took a call, went to an exit and propped it open and seemed to be signalling somebody. Another one said that tear gas was coming from two different directions. » The Terror Within: Former DHS Officer, Julia Davis Speaks Out! Alex Jones’ Infowars: There’s a war on for your mind! This former DHS employee, wife to a Marine veteran, followed proper procedures to report a national security breach to the proper authorities –literally– but then she was then investigated as a threat herself and it cost her years fighting false charges. They launched 54 investigations of her. After she complained under whistleblower protections about the DHS launched more actions against her, including landing a helicopter on her grounds in a raid on her house. They could have driven up and showed a warrant but they didn’t even have a warrant. Her dad came to the front of the house and asked What’s going on, and they threw him down on the floor and carried him outside, knowing he has a heart condition. They were looking, she said, fishing for anything they could use to “de-naturalize” these immigrants. He pleaded for water and heart medication, they instead sent away the ambulance and he had an untreated heart attack. IT IS A TESTIMONY AGAINST UNITED STATES AND INTERNATIONAL MEDIA THAT THIS STORY IS NOT BEING REPORTED ON THE “TRADITIONAL MEDIA”. The neighbor who filmed the raid was very worried about retaliation but still gave this brave girl Julia Davis. This neighbor, Matthew Judd, was later found suddenly dead on his couch. One of Julia’s witnesses, Britney Murphy, who openly refuted DHS documents about her testimony. She told a Hollywood Reporter that she was being followed and tracked and a helcopter followed her, and the reporter mocked her. She was an actress and it destroyed her career. Posted in Uncategorized | Comments Off on » The Terror Within: Former DHS Officer, Julia Davis Speaks Out! Alex Jones’ Infowars: There’s a war on for your mind! I just clipped it from a comment somewhere now lost in surfing memory. But Mike’s comment has a ton of truth to it. I warned Mike and everybody else who (I presume) was posting in favor of Obama that they would get the same of all the things they hated with Bush, and likely more, including the corporatocracy elements. #1.Obama not only has kept the worst core elements of the Patriot Act, his administration has expanded them. O’s Injustice Department has expanded Bush’s self-written search warrants to mean they are outside the jurisdiction of any courts, nobody can question them, nobody can sue against them. #2. Habeus corpus continues violated. #3. Not only did he continue both wars that Bush started to this day, he fought another one in Libya, supporting the genocide there against the town of 10,000 black folks, he supported surrogates in others, and they are providing material support to another Muslim Brotherhood-al Qaeda takeover. #4. Not only did he continue the Bush practice of waging war without a proper constitutional Declaration of War in Congress, he proceeded to tell Congress through subordinates that he did not even have the obligation to report to Congress a new war. (A war by any other name). Note for the gullible: Pearl Harbor was, is still today in fact, properly considered so, an act of war, like U.S. bombings in Libya and in Serbia. So he has continued the Bush wars and added a couple of his own. MEMO: 18,000 troops will stay in Iraq and that is not a withdrawal, and the embassy is the biggest in the world ever. #5. He continued the practice of keeping the number of warrantless searches secret. #6. Even before he was president, he pushed for TARP, which we find out poured trillions into private banks and overseas private banks and European banks, in a blatantly unconstitutional interference in the judicial branches, and not only that, refusing to prosecute an unknown number of actors in Wall Street that should have gone to prison in the first days of the Obama administration. Instead, the administration brought in Wall Street associates of these criminals, and chief Wall Street criminal protector Geithner brought into the Cabinet itself (who was head of the New York branch of the Fed at the time and enabler of bonuses at AIG). #7. He continued the Bush-era practice of hiring lobbyists into the administration, only more of it. #8. He not only continued the practice of protecting the exploding federal debt burden, he outdid the Bush era practice by orders of magnitude. NOBODY “inherits” a deficit, though. A deficit is when you spend more money THIS year than your revenues THIS same year, so a deficit has NOTHING to do with last year. #9. He has continued the Bush era practice of doing everything possible to stop any real fix to the oncoming debt tsunami and dollar crash. #10. He made the executive presidency even more renegade by not only continued the presumed and denied practice by previous presidents of ordering killings, surrogates have now bragged about him deciding every day who will be killed, without arrest, warrant, habeus corpus, or a trial, including American citizens. #11. O’s administration has expanded on the list of official bad guys for police and neighbors to suspect of terrorism, to add returning veterans, Ron Paul supporters, Constitution Party supporters, conspiracy theorists, and a few jihadist groups to make it look fair. This year it leaked that they have added “liberty lovers” to this official “unofficial” enemies list. #12. Bush doubled the size of Medicare with the pharmacy benefits, and Obama continued the practice of taking over this huge section of the private economy with the Unaffordable Health Care Act, and huge Medicaid expansion, but added a penalty/tax to compel participation for those who engage in breaking the law by doing absolutely nothing. #13. Obama continued the Bush precedent of appointing relatively unknown friends from the administration, Bush with Harriet Myers, Obama with not one but two: Sotomayor and Elena Kagan. #14. Obama has endorsed the ACTA treaty, which is another the gift for Big Corporate to add to the change in patent law. You invented it first does not count anymore, the patent goes to the company that files first. Now we find that the US is negotiating another treaty that will hurt individuals at the expense of more restrictions, the TPP (Trans-Pacific Partnership). #15. Obama has continued the Bush practice of acting like the increasing persecution of Christians around the world (as compared to other religions) does not exist, including the decimation and physical assaults on Christians in Iraq and Afghanistan where presumably it would have influence, and in Libya where the presidential regime allied with the mass murderers of Christian blacks. #16. Obama continued the interventionist policies of Bush in Latin America after promising a new era in relations, although he did modify the policy by actively trying to a slight change, to bully the nations into accepting Communist dictators like Manuel Zelaya in Honduras. #17. THE DIFFERENCE from Bush. The one visible difference (you have to look under the covers to see it) is the Cloward-Piven difference. That idea is to demand that the government fill ALL its promises and pay everybody their due and make them spend enough to bankrupt it. First proposed in 1966 and named after Columbia University sociologists Richard Andrew Cloward and Frances Fox Piven, the â€œCloward-Piven Strategyâ€� seeks to hasten the fall of capitalism by overloading the government bureaucracy with a flood of impossible demands, thus pushing society into crisis and economic collapse. The strategy is to make the “enemy” live up to their own rules, except I would say they only want those rules enforced in their favor and never against them. It’s also a “Trojan Horse” movement strategy, meaning activist groups that pretend to help the poor but it’s only meant to make their lot worse and lead to a breakdown in the whole system and bring down the government. Given his stance on Chick-fil-A, would Mayor Tom Menino grant permits to a group that has counted among its leaders a man who has repeatedly called homosexuality a “crime that must be punished” by death? Actually, he has done that . . . and more! Menino effectively gave away city land valued at $1.8 million to the organization, and he gave a speech at its ribbon-cutting ceremony. It’s the Islamic Society of Boston’s mosque, and when it comes to anti-gay sentiment, one of its early supporters makes Chick-fil-A look like the Provincetown Men’s Chorus. CEO of Chick-Fil-A said in answer to a question that he is “guilty as charged” in supporting the definition of marriage as man and woman. So the organization connected to an imam who says homosexuals should be put to death is okay for permits, and for special discounts on city property, but the company that emphasizes respectful service to all without regard to race, color, creed, or sexual orientation –yes, it’s explicit in their policy– is unwelcome? But that is not the argument of ability-to-pay ener­gumens. They insist that the State is a contributing factor in production, and that its services ought properly to be paid for; the measure of the value of these services is the income of its citizens, and a graduated tax on these incomes is only due compensation. If earnings reflect the services of the State, it follows that larger earnings result from more services, and the logical conclusion is that the State is a better servant of the rich than of the poor. That may be so, but it is doubtful that the tax experts wish to convey that information; what they want us to believe is that the State helps us to better our circumstances. That idea gives rise to some provocative questions. For the tax he pays does the farmer enjoy more favorable growing weather? Or the mer­chant a more active market? Is the skill of the mechanic im­proved by anything the State does with what it takes from him? How can the State quicken the imagination of the creative genius, or add to the wisdom of the philosopher? When the State takes a cut from the gambler is the latter’s luck bettered? Are the earnings of the prostitute increased because her trade is legalized and taxed? Just what part does the State play in production to warrant its rake-off? The State does not give; it merely takes. All this argument, however, is a concession to the obfus­cation with which custom, law and sophistry have covered up the true character of taxation. There cannot be a good tax nor a just one; every tax rests its case on compulsion.